As a law firm led by former prosecutors at the DA’s office, Jackson Bergman understands what it takes to fight DWI accusations. If you have been charged with criminal drinking and driving in the greater Binghamton and Ithaca NY region, it is imperative to hire a skilled DWI/DUI Lawyer to help minimize the impact this devastating charge can have on your life. New York State is known for having the toughest DWI laws in the country. Not only does NY penalize drivers with a Blood Alcohol Content (BAC) of .08 or higher, the state also penalizes drivers with a Blood Alcohol Content at or higher than .05%, also known as a DWAI (driving While Ability Impaired). When a driver gets to a point of having a BAC of .17% or higher, they may be charged with an aggravated DWI. 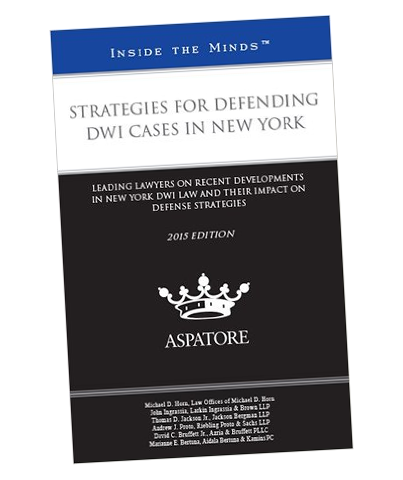 Regardless of what your BAC was at the time of your arrest, a lawyer who understands how New York State prosecutes those accused of DWI can be paramount in protecting your rights in a DWI case and working with you to create a positive outcome that will allow you to move forward with your life. An arrest for drunk driving in New York carries serious consequences. Those charged with DUI/DWI can face jail time, suspension or revocation of their driver’s license, fines that can feel unsurmountable, and mandatory alcohol screening along with educational courses. The state also now mandates vehicle interlock devices for certain DWI offenses that can prove embarrassing and inconvenient. Even if your BAC was only .05%, you can still be subject to many of the same consequences as higher BAC offenders. All of these consequences can lead to lingering issues which can impact your employment, raise your insurance rates and affect your future career options. Being charged with a DUI or DWI doesn’t necessarily mean you will be convicted and automatically lose your license. The state of New York must prove the criminal charges that have been made against you and the law entitles you to challenge the strength of the state’s case. Hiring an experienced DWI/DUI Attorney will allow you to better defend your rights against a criminal charge of drinking while driving or drinking under the influence. Contacting an attorney early on is important when you are charged with a DUI/DWI or DWAI. There are certain defenses that need to be brought up promptly or you risk losing the right to assert those defenses. When you contact Jackson Bergman to defend you in your case, you get the peace-of-mind in knowing you’re hiring an experienced DWI defense team that has worked on both sides of the law and understands what it takes to successfully defend your rights. New York State has a “prompt suspension” law that makes it very likely your driver’s license will be suspended at your arraignment. An experienced DUI attorney can assist you in challenging this law in order to obtain conditional driving privileges that will help you continue to commute to your place of employment. In addition to aggressively defending your right to drive, our team will diligently defend you against a DUI/DWI conviction and protect you from the devastating results of such a conviction on your record. We do this by relentlessly reviewing the facts involved in your accusation and by formulating a plan to raise all applicable defenses during the course of your DWI/DUI case. What are Your Chances of Beating a DUI/DWI in Broome County or the Greater Binghamton Region? This is difficult to answer as every case is unique but we can tell you your chances of beating a drunk driving accusation are very slim unless you hire an experienced DWI team to fight on your side. You are granted some leniency if it is your first offense, however, if you have been previously convicted of a DUI/DWI, it is especially important to seek legal advice from a DWI defense attorney who is well versed in the intricacies of a DWI/DUI defense strategy. Certain defense strategies and the circumstances surrounding your arrest may enable evidence to be suppressed in your case leading to the dismissal of the charges or a reduced charge that does not have the criminal consequences of a DWI/DUI conviction. Some of these defenses can include police not having probable cause, an improper arrest or testing procedure, bringing in credible witnesses who attest to you being sober and malfunctioning testing equipment. While not an exhaustive review, requesting a free case review from our attorneys can help provide more insight into viable defense strategies we can utilize to prove your innocence or lessen your charge. If you were pulled over for a legitimate reason, then the police officer may ask if you have been drinking. If you deny this and they still want to perform a field sobriety test, then you may refuse to do so. Generally the refusal of a field sobriety test will come with the request of the officer to give you a breath or chemical sobriety test. If you refuse these tests as well, then you can lose your license for at least one year. You were stopped for an invalid reason. There was no probable cause for the officer to request a chemical or breath test. The breath or chemical test that was given had invalid results. The reason why you refused to take the breath or chemical test was legitimate. There was no probable cause for the officer to assume that you were under the influence of drugs or alcohol while driving. In order to properly fight this test, an experienced DWI lawyer who knows how the testing mechanisms operate is needed. The lawyer will be able to contest: the way the tests were administered was improper, the mechanics of the testing mechanisms or that the driver has a medical condition that affected the test results. These things could result in the court ruling that the results from the chemical or breath tests were inadmissible, which will throw the case out. There are strict protocols when it comes to taking breath or chemical tests. If these protocols aren't followed exactly, then it's likely that the DWI charge can be reduced or thrown out. Being charged with a DWI means you will automatically have your driver's license suspended and you will have to go to a proceeding for it in court. At your administrative hearing you will need to fight the suspension so you can get your driving privileges back. If you end up successful at this hearing, then you may also have your criminal case thrown out, but this is not guaranteed. If you do not fight the suspension at your administrative hearing, then you will lose your privilege to drive, even if you are found to be not guilty later on in time. One of the most serious driving charges a person can get is a DWI, which is otherwise known as driving while intoxicated. The consequences of this charge are all serious and vary for each and every person. Because there are so many DWI cases, there are now a lot of attorneys who limit their practice to DWI defense and only practice in this area of the law. Here are some of the most common reasons why DWI cases are thrown out today, thanks to the help of these lawyers. Our DWI attorneys attend extensive seminars and training led by Charles James Rathburn, Jr. a DUI Defense Attorney and a court acknowledged expert on the standardized DMT breath testing machines. Our attorneys bring the breadth of knowledge gained from these intensive seminars to the courtroom to defend our clients against DUI/drunk driving charges. DUI charges are not be taken lightly in the State of New York. Our team of lawyers is highly experienced in representing drivers in New York who are charged with drunk driving and our team has an excellent track record of success in defending against such charges. While we can’t guarantee a similar outcome in every case, we can assure you that when you contact Jackson Bergman, you are taking the best step forward in a positive outcome for your case with the goal of allowing you to put this event behind you and move forward with your life.